$50 one-hour massage for first time clients. Welcome to Denton Chiropractic Center, your chiropractor in Denton, Texas! Call us today at 940-566-3232! Located in the heart of Denton, Texas the leading health professionals at Denton Chiropractic Center are dedicated to helping you achieve your wellness objectives -- combining skill and expertise that spans the entire chiropractic wellness spectrum. Relief care is also available at Denton Chiropractic Center for conditions such as sciatica, low back pain, carpal tunnel, neck pain, headaches, fibromyalgia, and arm or leg pain. The doctors treat conditions caused by trauma from falls, car accidents, or work injuries with expertise and success. Dr. Kent Noell, Dr. Melissa Noell, Dr. Marcus Villarreal, and Dr. Susan Aurich are committed to bringing you better health and a better way of life by teaching and practicing the true principles of chiropractic wellness care. Patients seeking treatment at Denton Chiropractic Center with Drs. Kent Noell, Melissa Noell, Marcus Villarreal, and Susan Aurich are assured of receiving only the finest quality care through the use of modern chiropractic equipment and technology. Drs. Kent Noell, Melissa Noell, Marcus Villarreal, and Susan Aurich along with the staff have a genuine concern for your well-being! If you are new to our website, please feel free to discover and learn about chiropractic wellness. If you are interested in starting your journey towards wellness please subscribe to our award winning newsletter. If you are already a newsletter subscriber, please explore the member wellness section of our website for wellness articles, resources, and health facts---specifically targeted by Dr. Kent Noell, Dr. Melissa Noell, Dr. Marcus Villarreal, and Dr. Susan Aurich to your wellness needs and interests. Serving Denton County for 35 years! Most insurances accepted; we simplify your insurance providing care at little to no cost to you. Auto accidents, and work injuries are usually covered in full. We have a payment plan for every pocket book. "I've been going to Denton Chiropractic Center for years. They've helped me through a car accident, work injuries, and normal stresses. The staff is friendly and approachable. I highly recommend going there." "The people here are kind, experienced, flexible, and have made my lower back issues a thing of the past. If you're unsure about chiropractic care, I can promise you this team of doctors and staff will make you wish you had done it sooner!" "I have been to several Chiropractors but this office seems the most holistic and gives me the best quality services for the cost. Everyone in that office works together as a team towards the same goal of your health and healing. It's my first and only choice!" 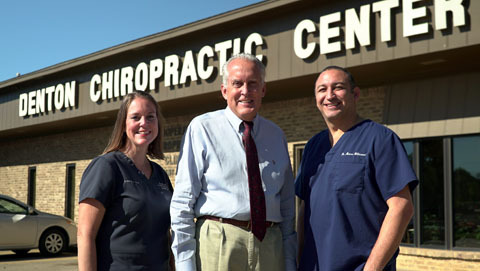 "had been visiting Denton Chiropractic Center one more years ago or two with a great experience. Dr V and M are both nice, very experienced, and professional masters. Recently I had my right hip joint issue, I just went visiting Dr V. He is very professional and I feel my problem improved a lot. Also, everyone is friendly in the office. Thanks!" "Very informative on what they are doing as they are working on you. They discuss in detail, while showing you your x rays and what need to happen in order to help you back to recovery. I have referred my own family here." "Dr. Melissa is amazing, as well as everyone else in the office! Extremely sweet & very friendly!! Dr. Melissa takes time to explain things thoroughly & doesn’t rush you off. I’m actually starting to feel like I’m on the road to feeling much better due to Dr. Melissa & her staff." "Staff and doctor are so friendly and they keep you informed of what's going on and what to expect love that they work with my work schedule."